Family-focused QSR franchise, Red Rooster has unveiled two new restaurant designs set to revitalise the brand’s customer experience. 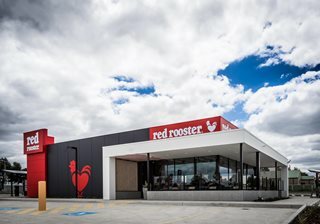 The restaurants, located in Craigieburn in Victoria and Mt Ommaney in Queensland’s outer suburbs are the first of Red Rooster’s new generation of drive-through boutiques, and feature a modern twist on the iconic branding. Nick Keenan, Red Rooster CEO told Inside Franchise Business the restaurants had been designed to improve in-store customer experience, while at the same time build on the brand’s commitment to innovating its offering. “The new restaurant designs are about resetting our brand across all the key customer communication touch points and to leverage our wonderful Aussie spirit and heritage in a modern and contemporary way,” Keenan said. The latest redesign sees Red Rooster incorporate state of the art, energy-efficient operational equipment, integrated music systems that automate volume setting, time of day and playlist selection as well as introduce navigational signage that alters the way customers engage with the restaurant. In an innovative move, the two restaurants also feature click and collect bays, offering customers a convenient experience for those who engage via online, mobile or e-commerce ordering platforms. Designer of the restaurants and director of The Great Indoors, Lee Hopkinson, said the primary focus of the project had been bringing the brand into the new era. “The general consensus was that the current design was quite dated and needed to progress. Overall, it needed to have an overhaul and feature a design that moved with the brand, and we were able to achieve that through using those brand colours as highlights for both the exterior and interior and improving all customer touchpoints,” Hopkinson said. Hopkinson said the redesign signalled a move away from traditional fast-food, placing Red Rooster on a new tier of dining experience. While the store designs have shown a marked improvement in customer experience, Keenan acknowledged that it would take some time to refine the core concepts before national roll-out would commence. “Once we settle on the key concepts and final brand guidelines, build and design will be rolled out nationally over the next few years,” Keenan said.